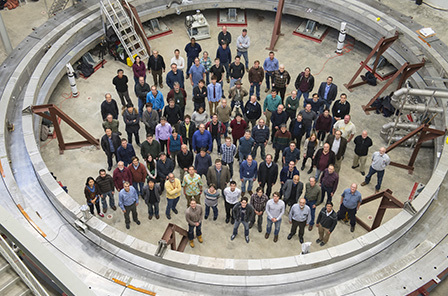 Muon g-2 (pronounced gee minus two) will use Fermilab's powerful accelerators to explore the interactions of short-lived particles known as muons with a strong magnetic field in "empty" space. Scientists know that even in a vacuum, space is never empty. Instead, it is filled with an invisible sea of virtual particles that –in accordance with the laws of quantum physics– pop in and out of existence for incredibly short moments of time. Scientists can test the presence and nature of these virtual particles with particle beams traveling in a magnetic field. The Muon g-2 experimenters will examine the precession of muons that are subjected to a magnetic field. The main goal is to test the Standard Model's predictions of this value by measuring the precession rate experimentally to a precision of 0.14 parts per million. If there is an inconsistency, it could indicate the Standard Model is incomplete and in need of revision. With the MC-1 building complete, the 50 foot wide Muon g-2 electromagnet arrived at its new permanent home at Fermilab in July 2014. The Muon g-2 team is currently completing reassembly of all the magnet components. Soon, the coils will be cooled to near absolute zero with liquid helium so that the superconducting magnet can undergo tests and commissioning. During the summer of 2013, the Muon g-2 team sucessfully moved the 50-foot-wide particle storage ring 3200 miles by land and sea from New York to Illinois.�Follow the move�of the ring with our GPS-powered map and blog.